These road dogs have now just finished up their 3rd full-length album, the self-titled K-Man & The 45s, recorded and mixed by Alex Giguere (The Beatdown) and mastered by Ryan Morey (Arcade Fire and much more). The 12 song album features many flavours of ska, beginning with the rocking stomper They Gotta Know, a Sci-Fi movie hit, Space Thriller and even a cover of Montreal legends, The Kingpins, Party in Ja. (given to K-Man as a birthday gift from writer and frontman Paddy Walsh). K-Man & The 45s has always felt more comfortable on the road than at home. They have toured the country countless times playing coast to coast. They’ve also shared the stage with a million bands including The Slackers, Big D and The Kids Table, The Satellites, The Original Wailers, The Planet Smashers, The Brains and I could easily fall in to simple name dropping here and go on and on. 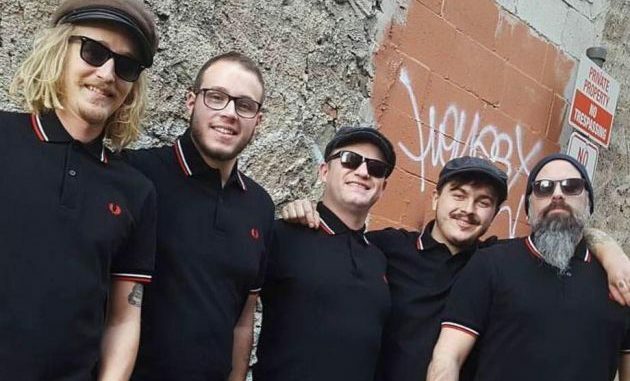 No stranger to the festival scene they have headlined The Ottawa Ska festival, The Montreal Skafest, Music For The Masses and headlined a bunch of others including NXNE, KOI music fest, Festival de la Gibelotte… you get the idea. K-Man says he is more proud of this album than any other he has ever done. Moving forward means playing live as much as possible. K-Man & the 45s will be in a town near you shaking the floorboards with mad skanking good times! The brilliant self-titled third studio album from Montreal’s K-Man & The 45s comes with the very sad news that the drummer Brian Mac Smith has terminal pancreatic cancer. He is obviously now unable to work and having cancer doesn’t mean you have to stop paying the bills so the band have set up a Go Fund Me page here in support of Brian.